Take for example, the original wooden Sacred Heart Church, which was destroyed by fire. Then there was the St. Barnabas church which dominated the Bourda skyline for decades. There was a virtual uproar by many citizens when it was demolished. While the Sacred Heart church was rebuilt in concrete, the location of the St. Barnabas church is now used for a car park. The historic and iconic wooden St. Andrew’s Kirk, has dominated the junction of Brickdam and High Streets in Georgetown for two centuries. 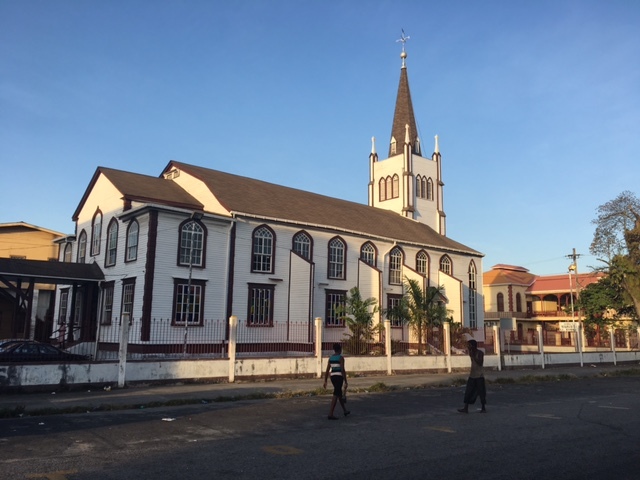 During its initial existence, the St. Andrew’s Kirk, which is located at the western end of Brickdam, opposite the Parliament in Georgetown, practiced apartheid. What many citizens of today do not know, is that people of African heritage, were not allowed to sit in pews at the front of that church during services, back in the days before Emancipation, and for a long period after. They had to sit at the back of the church. In fact, there was a bold sign which stated that policy. What many Guyanese are also unaware of at this time, is that this year, 2018, that wooden iconic Guyanese structure, is 200 years old. Its foundation was laid in 1811 by the Dutch Reformed Congregation, but due to financial constraints, it was acquired by the Scottish Presbyterians two years later. Construction dragged on for almost five years, after which it was official opened for service on February 28, 1818. Over the past two centuries, this historic building has overseen many activities; to its east at the Georgetown Magistrates’ Courts were many sensational trials, criminal and political, which were conducted there. To the west the development of the Banks DIH conglomerate – restaurant, hotel and bar. To the north, the St. Andrew’s Primary school, and to the south, the Public Buildings which previously accommodated the Office of the Prime Minister, and to date, the Parliament chambers. Many were the demonstrations on Brickdam within the St. Andrew’s Kirk block. There were also many international visitors, including the Queen of England as well as many Heads-of-State from around the world. This, the oldest church on Brickdam, as well as in the rest of Georgetown, has ‘seen’ many changes during the past two centuries. From the time when Africans were not permitted at the front, until the present time when a woman of African Heritage, Rev. Maureen Massiah, is the presiding Pastor. Over the past two hundred years, the building has been well-maintained, and stands proudly, dominating the Stabroek skyline in all its elegance. Three funerals of note of more recent times which were held at the St. Andrew’s Kirk, are those of Guyana’s most celebrated Boxer, Cliff Anderson, at which the then Mayor of Georgetown, Hamilton Green, gave a most detailed eulogy about Anderson’s celebrated life, in and out of the Boxing ring. The funeral of Ombudsman, the late Justice Winston Moore, was another. The third funeral of note in that iconic building, was that of Mathilda Lewis, a simple person, who was, during her latter years of life, Guyana’s, the Caribbean’s and South America’s oldest living person. She passed away at age 113. As a life-long member of the Kirk, she was well taken care of by a special group of volunteers, during her Golden years. As mentioned earlier, there was the time when non-whites were not permitted to sit in the “whites only” pews in that church, however, today that is a long-gone rule, almost forgotten, and now all aspects of the running of the church is done by non-whites. One of the more unusual modernization in the services, is the establishment of a steelband. The players are all young people; mostly teenagers. Over the past two centuries, the St. Andrew’s Kirk has witnessed many historic events; one of the earliest was the public hanging of the former enslaved African, Damon, which was carried out in the compound of the Public Buildings. Over a century later, the Ivor Thom designed Damon Monument, was on public display on the parapet car park at the south side of the church, for a week. During that period, thousands turned up to see “Damon”, as the Kirk silently ‘looked’ on. At the end of the one week display, the Damon Monument was transported across two rivers – the Demerara and the Essequibo – to its permanent location at Anna Regina. Damon was enslaved on the Essequibo Coast and was condemned to death, having been found guilty of planning an insurrection, of which he claimed his innocence in an emotional speech to those who went to witness his execution. Maybe, one day, there will be an official pardon by the British for Damon. Maybe, prayers will be said in the St. Andrew’s Kirk towards that possibility. One of the many inclusions within the worship at the St. Andrew’s Kirk, is with the music. The organ is still the principal musical instrument during services, with Elder Lynette Cunha, the Organist. As previously mentioned, there is now a small steelband which plays at services from time to time. The players are mostly teenagers and some in their twenties. They are tutored by veteran panman Mr Calvin Whyte. One of the events of this 200th. anniversary celebration of the St. Andrew’s Kirk, was a clothes drive for the needy. There was also a Family Fun Day which was held at the Camp Ayanganna Ground in Georgetown.